Beware enormous scary bigfooted monsters. And myths. Seven-foot tall hairy dudes running around the Himalayas. Cyborgs invading from another planet. Or how about an island in Indonesia where three-foot humanoids cavort with tiny elephants? Just as surely as children have nightmares, people have been imagining craziness of all kinds since the beginning of time. Take a look at that bigfoot crossing sign up there, and imagine you're a local cattle rancher: So ... maybe there's a bigfoot out there, eh? Let's keep the cows down on the flatlands. No telling what might happen to them up in these here hills. The truth, however, is that the first rancher to send his cows to the hills will find they get nice and fat grazing on that untouched land and -- despite the scary folklore -- they are incredibly unlikely to be harmed by any beast with big feet. If it happens, it will be the first case of such a thing ever being documented. All of which is a fancy way to introduce the news that there's another new study about the hot hand in basketball. It is big and rigorous and it confirms what the last big study found: That players shoot like the hot hand is the most real thing ever, but that in fact it's almost impossible to find and might be entirely mythical. It's not a stretch to say your team is losing some games, every year, because of folklore. For real. Bigfoot is hurting you in the standings. To be clear: No one can say for certain whether bigfoot or the hot hand really exist. 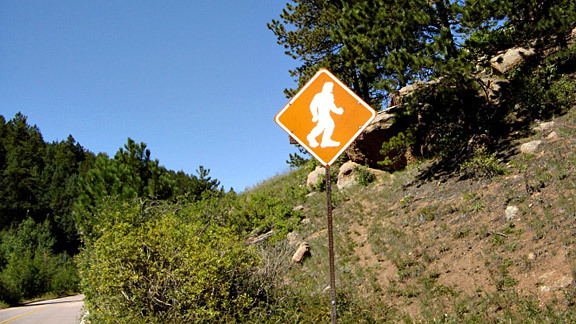 But what we can say for certain is that a huge percentage of bigfoot sightings have been hoaxes. And we can say for certain that players believe in the hot hand way more than it exists. In fact, shot selection gets so wacky after players hit a shot or two that it hurts their teams. They are betting wins and losses on the idea that this next shot is more likely to go in if the last one went in. And instead of making more after makes, they shoot sooner and from further away and miss more than normal. "These results suggest that players attempt too many 3pt shots after a made 3pt," write the researchers, "and too few after a missed 3pt." It's part of a bigger body of research about how humans learn. We have a tendency to put too much emphasis on things that just happened. That last made shot sends us a strong signal we are great shooters. The researchers noted that after hitting a 3, in his MVP 2007-2008 season, Kobe Bryant's next shot would be another 3 53 percent of the time. After a miss, his next shot would be a 3 a mere 14 percent of the time. One little make has a massive effect on his offensive philosophy. The researchers were nice enough to send me spreadsheets with a lot of the data they studied from the 2007-2008 and 2008-2009 seasons. And you can see it all in there, plain as day. Here are players like Rudy Gay, Dirk Nowitzki, Chris Paul, Kevin Durant, Deron Williams, Brandon Roy, Nick Young, Richard Jefferson, Kevin Martin, Rip Hamilton, Steve Nash and Carmelo Anthony. And like clockwork, after hitting a 3, they are dramatically more likely to shoot another one. And remember, those 3s after you just made one ... they miss a lot. In fact, a decent way to predict who will miss a shot is to pick the guy who just made one. The hot hand may exist now and again, but the cold hand definitely does, and it belongs to the guy who just hit a shot. And the reason that person misses is because their next shot is much more likely than normal to be early in the clock and far from the hoop. In other words, a bad shot. A shot that would have been avoided if players had just played normally, which they didn't do -- and this we all know from our pickup games -- because the team had a hot hand to feed. In a league where the average game is decided by a bucket or two, a rushed, bad, long shot or two hurts how well your team does, just like keeping the cows out of the hills can hurt the ranchers. Researchers can't say with certainty that the hot hand does not exist, just as people can't really say there's no such thing as a yeti. But planning for a yeti, or a hot hand ... that's just no way to win. Which is not to say the entire world is mundane and rational. There still are signs of the supernatural here or there, including this: Those mini-humans in Indonesia with the tiny elephants in Indonesia? They were real.